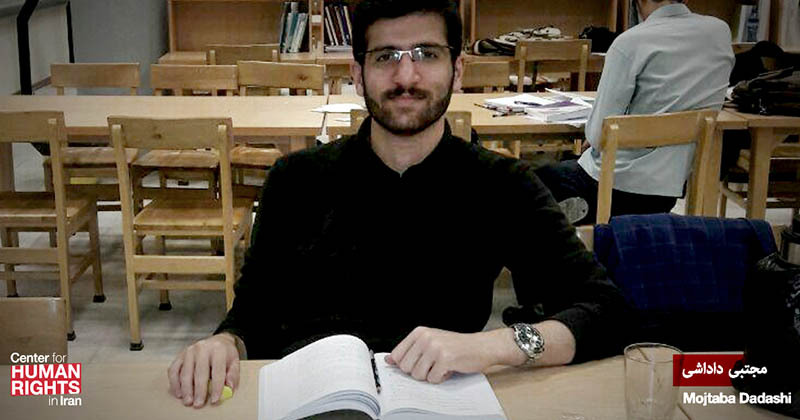 Iranian university student Mojtaba Dadashi, 23, has been sentenced to three years in prison and 74 lashes for sharing a video on social media criticizing the Islamic Republic as "un-Islamic," the Center for Human Rights in Iran (CHRI) has learned. "This young man was condemned on three charges in a closed trial just for publishing a video in which he said some critical things for a few minutes," said a source with detailed knowledge about Dadashi's case on April 9. "This is completely unfair. The court was obviously taking poetical revenge." The source continued: "Mojtaba did not have a lawyer because he thought for sure he was going to be acquitted. He only prepared a comprehensive statement in his own defense and appeared in court with some of his professors. But they were told the trial is closed to the public and the professors were not allowed inside." "This regime is neither Islamic, nor a republic, nor revolutionary," Dadashi said in the video addressing the Islamic Revolutionary Guard Corps, an elite branch of the Iranian military, and members of the Basij paramilitary force. "This regime is ruled by a minority that has sucked the blood out of this country for 40 years." Dadashi was charged with "insulting the leader [Ayatollah Ali Khamenei]," "propaganda against the state" and "insulting the heads of the three branches of state." Held behind closed doors in Sabzevar on March 16, 2019, Dadashi's trial was presided by Judge Mohammad Gholami. "They had shaved his head and brought him into the courtroom with cuffs on his wrists and ankles," the source, who requested anonymity for security reasons, told CHRI. "All he did was criticize. He didn't commit a crime." "To protest against the unjust judicial process in his case he is not going to lodge an appeal," added the source. "If he does ask for an appeal, it means he approves of the judicial process." On April 3, the day he was informed of the verdict, Dadashi posted another video condemning his sentence as a move against "freedom and justice." "I am being treated in the worst way even though in [the supreme leader's] speech in Mashhad on March 21 , Mr. Khamenei said opponents of the state are free to speak and no one will bother them," Dadashi said. He added: "I invite Mr. Khamenei and all the other top officials of the country to an open debate... I'm certain that the people will run out of patience. My back is ready for your whip." During a speech in March 2018, Khamenei falsely claimed, "no one under the Islamic Republic is pursued or put under pressure for being opposed to the government."